The Rio Grande | Can I Bring the Dog? 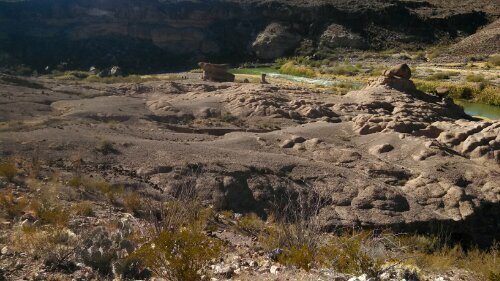 On New Year’s Day Chico and I drove along the Rio Grande, in the Big Bend, looking at Mexico. 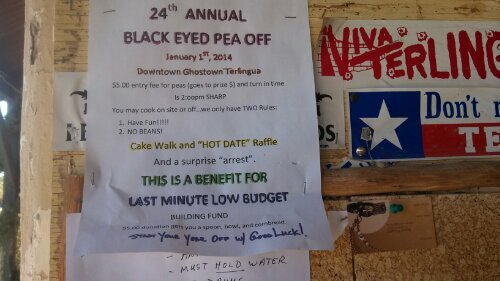 And we stopped in Terlingua for the annual (Black-eyed) Pea Off. There were a lot of dogs in attendance, and many of their people were drinking beer (it is, after all, Texas) and not paying so much attention to canine relations, so I decided that Chico should stay in the car until I was finished eating. Then I let him get out, and he ran around, played a little fetch and some tug, had a pee, made some new friends – some nice folks hanging out at their car instead of in the middle of the crowd – and we called it quits. Stop on a high note. Don’t take Chico any deeper into the crowd than the outermost trash can. This entry was posted in Uncategorized and tagged terlinga tx pea off, Terlingua. Bookmark the permalink.